The results of a catalog search may be written to a file by selecting the "Save" toolbar button while the the Results tab of CSCView is open, or by clicking the "Save Results to File" box in the Query tab before actually submitting a query. The save files output in Tab Separated Values (TSV) format consist of headers commented with '#', which contain definitions of the CSC columns in the table, as well as data type and format information. There is a row of CSC column names beneath the header, and beneath that are fixed format, tab-separated columns of data values. TSV files are compatible with Vizier and Aladin, and also with the CIAO Data Model. This file can now be used directly by CIAO tools as well as being imported into SAOImage ds9. Last Update: 13 Aug 2013 - Rewritten to highlight that CIAO can now read TSV format directly. The CXC Datamodel can read and write various ASCII file formats. Many of these can be automatically recognized by first few lines in the file; however, the Tab-Separated-Values (TSV) returned by CSCView needs to be explicitly identified. Quotes are likely going to be needed when commands are run on the UNIX command line but should be omitted when a CIAO tool prompts for the value. Note: The VOTable (XML) format output is not supported by CIAO tools; however one can use the Python XML parsing routines or other third-party modules to read such files into Python applications. One example is the astropy.io.votable subpackage of Astropy. With the virtual file specification discussed above, all the CIAO utilities are now available for use. 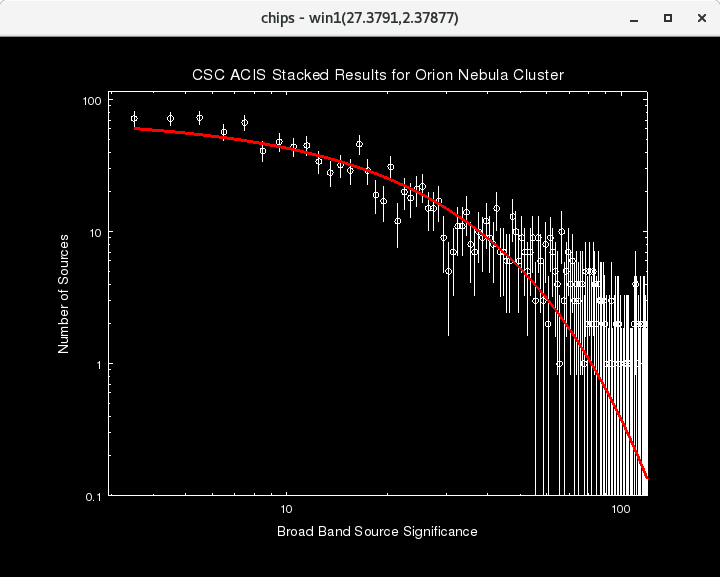 Suppose we have done a CSCView search, specifying that we wanted all the results for ObsID 4396, one of the observations of Orion and have saved the TSV format file as 4396.tsv. We can now use the various CIAO tool to inspect and analyze these data. In the first example we see which columns were selected, including the units and comments, as well as the number of rows (ie number of sources). If we wanted to check to see how many sources are unambiguous (ie not confused with other sources in other observations) we can simply use the dmfiltering syntax. which shows us that 1028 out of 1040 sources are not confused. unix% dmstat "orion.tsv[opt kernel=text/tsv][cols flux_significance_b]"
Here we have determined the range of the broad band source significance values using dmstat, used that range to extract a histogram of the number of sources with flux significances between 1 and 250 with dmextract and then input the data into Sherpa to fit the profile with an exponential model, as shown in Figure 1. Obviously this is not a great fit to these data, but the purpose of this example is to illustrate the types of analysis users can perform. 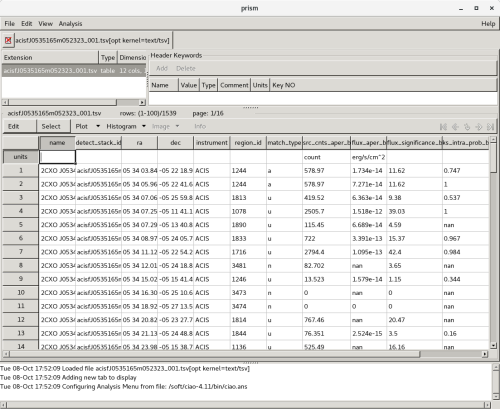 We can also use the prism file viewer to display the contents of the TSV file, as shown in Figure 2. 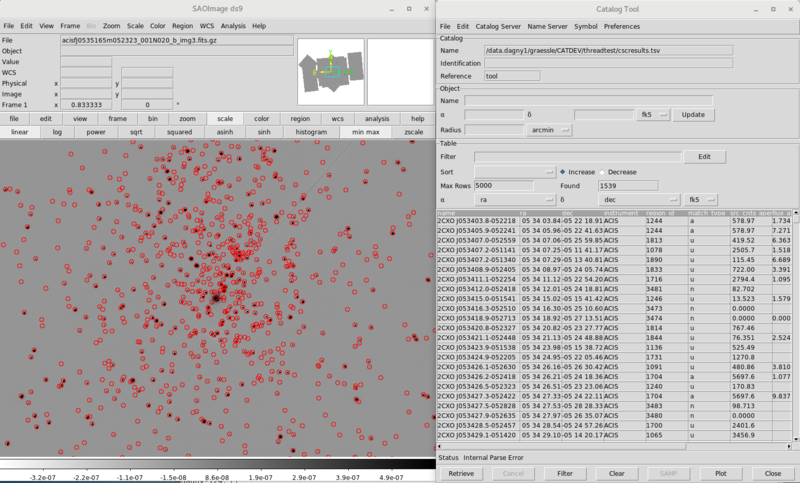 The catalog tool can then be used to select sources, create plots of source properties and participate in SAMP enabled analysis sessions with other SAMP aware applications. 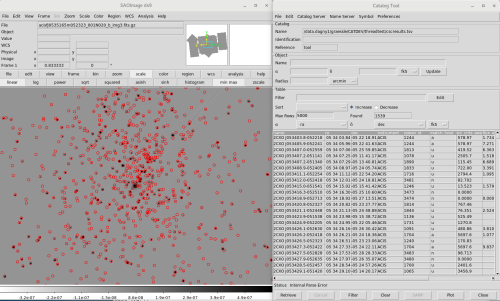 11 Aug 2010 updated for CSCview version 1.1: conversion script updated to accept TSV format save files in place of RDB format; 'cone_distance' catalog parameter has been changed to 'separation'. 13 Aug 2013 Rewritten to highlight that CIAO can now read TSV format directly.